Hillsdale and Hudson are visitng Mexico City when a magnificent sapphire is found in a Mayan tomb. The demonological duo are asked to try and solve the mysterious deaths that began soon after the unearthing of the mesoamerican treasure. They find themselves entangled in an indian rebellion against the Mexican government, and are soon deep in the rainforests of Central Mexico. 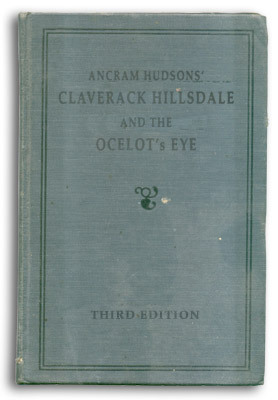 Hillsdale believes the revolution and murders connected and decides He must return the sapphire, or the Ocelot's Eye (as the indians call it), to its former home in the lost city of the maya. Lots of 18 letter Mayan names cloud Hudsons normally terse writing, and the plot is very much the creation of a victorian mind. The indians are regarded via the "noble savage" model and Hillsdale's normal sense of superiority takes on a note of racial supeiority. one of my students, an african american girl, pointed this out to me. I am sure that Hudson was just writing in the style of the times and its' just postmodern myopia to read modern political themes into a book published just after the turn of the century. It was literally a different world back then, and I don't know if we can judge it. Actually, that was the other point my student made. Regardless of the controversy, Ocelot's Eye is regarded by many to be one of the top five Hillsdale adventures of the entire run.